I was first introduced to the old Yiddish writers, Mendele Mocher Sforim, I. L. Peretz, and Sholem Aleichem, in the early 1960s. At the time, I was a teenager growing up in Southern California, and with my sister, Robin, was attending a secular Jewish school called the Los Angeles Mittleshule. Every Saturday we took classes in Jewish history, language (Yiddish), and culture, including music, drama, and literature. It was here that I first read the short stories of Mendele, Peretz, and Sholem Aleichem, and fell in love with them. But as so often happens, life interceded. As my career as a public television producer/director took me off to several places across the country, I always dutifully packed and then unpacked my books of Jewish stories, placed them on the bookshelves of each new home, and promptly forgot about them. 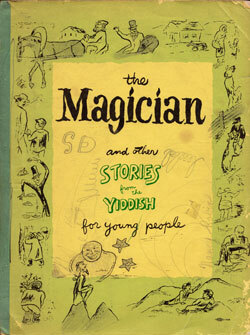 Almost forty years passed before I had the opportunity to really look again at my once beloved Jewish stories. In 2001, I volunteered to teach a ninth grade religious school class at my local synagogue in North Carolina. Having had no experience teaching 9th graders, I was totally unprepared for the experience. What I found was a rather rowdy and unruly bunch (may no shame befall them). When they weren’t sleeping, they were laughing, teasing, and punching each other. The class was noisy as usual that morning as I opened the book and began to read aloud. Suddenly the room got quiet—very quiet. “How could they fall asleep so quickly?” I wondered. But when I looked up, I couldn’t believe my eyes. Everyone was wide-awake, staring back at me, totally and completely alert. They listened closely, interrupted only for words they didn’t understand, and when the story was over, we had the most amazing discussion. I tried it again a few months later with a story by Sholem Aleichem. Same effect. A miracle! Though these stories were written over a hundred years ago, they still had the power to hold the attention of a Jewish audience—even a Jewish audience of ninth graders! And that is what rekindled my interest in old Jewish stories, and set me on an adventure filled with wonderful new discoveries and great companions.